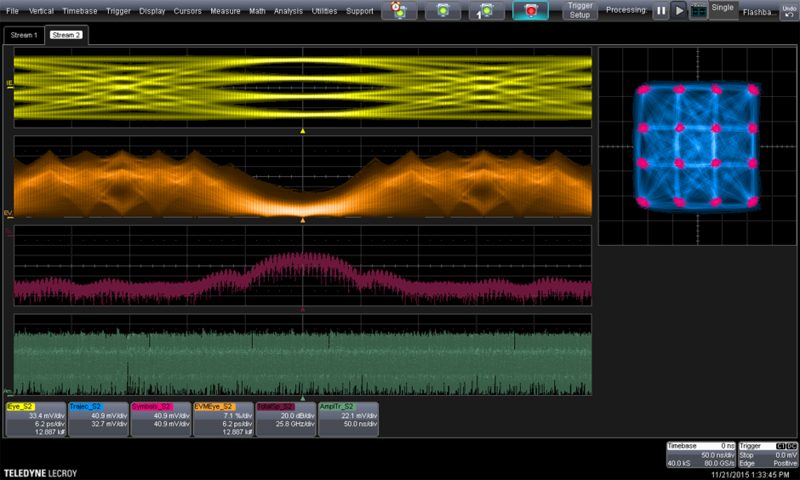 VectorLinQ transforms your Teledyne LeCroy oscilloscope into the most flexible vector signal analysis platform available. 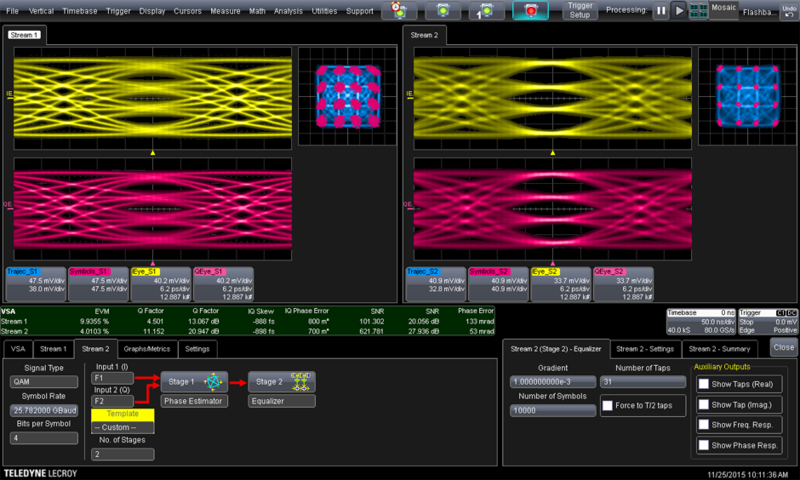 Acquire up to eight inputs through the oscilloscope channels - PSK, QAM, Circular QAM, ASK, FSK, signal types are all supported, as well as user-defined symbol configurations and OFDM formats. VectorLinQ operates through a unique, intuitive model, passing the signal through a chain of user-defined processing blocks, to make the most sophisticated analysis simple. Standard processing blocks include mixers, filters, phase estimators, and equalizers - as well as the ability to insert custom MATLAB processing blocks at any point in the processing chain. VectorLinQ VSA offers various ways to analyze and view demodulated waveforms. The I-Q constellation diagram helps identify signal quality issues such as amplitude imbalances, quadrature error, and phase noise. I and Q components, Amplitude, Power, Phase, and EVM can be viewed as “traces” in the time domain, fully correlated with other waveforms in the oscilloscope. Any trace can also be viewed as an eye diagram, providing deeper insight into the signal quality of the demodulated waveforms. Spectral views of the total signal, as well as the individual I and Q components, are also available as standard. For OFDM signals, EVM can be visualized on both a by-subcarrier and by-symbol basis. Custom MATLAB blocks can be inserted at any point in the processing chain, and the results returned directly to VectorLinQ to be passed on to the next processing block, visualized, and measured. 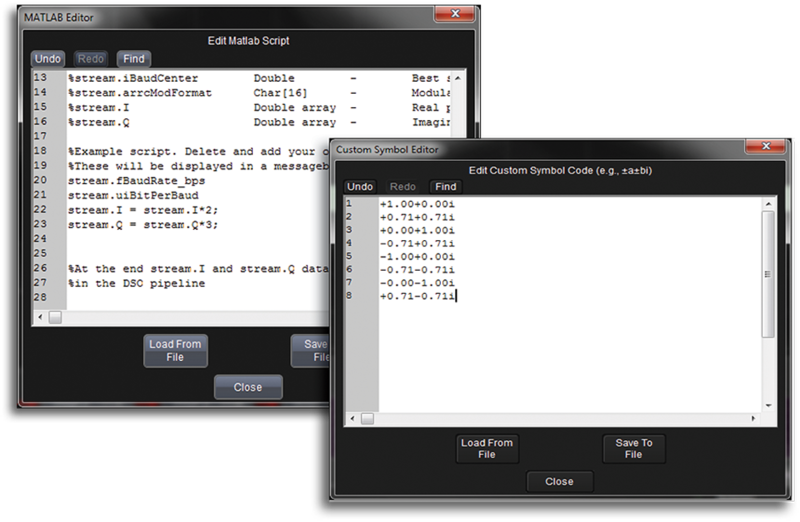 Example MATLAB code is included directly inside the VectorLinQ application. 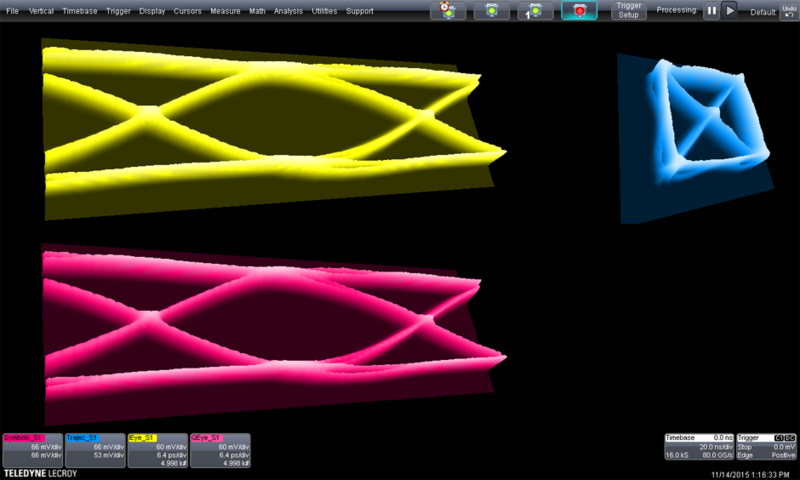 VectorLinQ also allows analysis of completely custom modulation types through a set of user-defined symbol positions. For leading-edge communications R&D, VectorLinQ Advanced offers comprehensive OFDM analysis and visualization capabilities. Plot Pilot EVM, Data EVM, and Average EVM by subcarrier and by symbol. Measure EVM % values and magnitude error for data and pilot signals. 802.11a protocol support is included standard, as well as sample metadata for creating profiles for other standard and custom protocols. 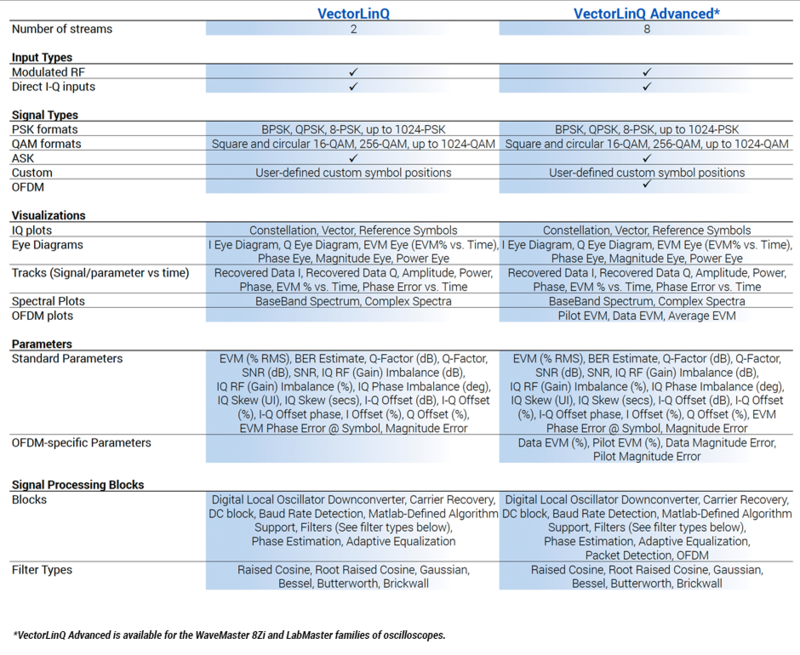 VectorLinQ Advanced is available for the WavePro 7Zi, WaveMaster 8Zi, and LabMaster families of oscilloscopes. 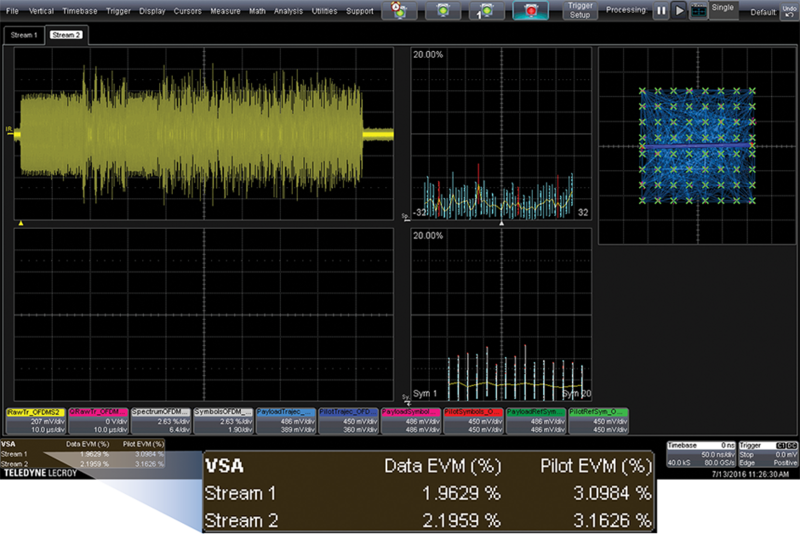 VectorLinQ VSA is not a standalone application that “takes control” of the oscilloscope - it integrates seamlessly with Teledyne LeCroy’s MAUI - the most advanced oscilloscope user interface available. Signals and parameters from VectorLinQ are available to be used elsewhere in MAUI, for simple and complete control and analysis.